Fish And Dal / Meen Parippu Curry | Simple and Delicious ! 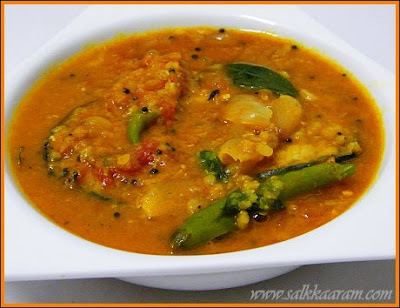 I can see some frowned faces when seeing a fish curry prepared with dal. Had seen the same when published a chicken curry with dal long back.. With dal, chicken or fish or any thing, tastes great, no doubt! Cook dal in enough water with 1/4 tsp turmeric powder and salt. Cut tomato into big pieces. Soak kudampuli (or use enough tamarind pulp) in water for some time. 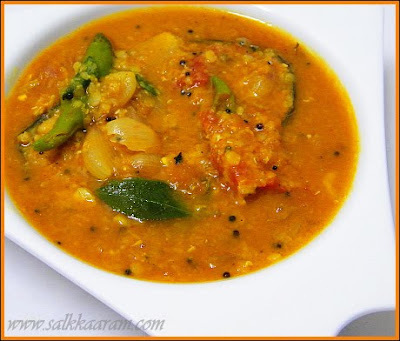 In a pan put the crushed ingredients with tomato ,kudampuli, 1/4 tsp turmeric and red chilly powder. Pour enough water to cook, approximately 2 cups or more. Add salt, allow to cook until the onion and garlic are cooked. Put fish fillets and cook. When the fish pieces are half cooked add previously cooked dal into it. Mix and let it cook again until the fish pieces are done. Adjust the sourness according to your taste. When oil separates on top remove from fire. Heat oil, add fenugreek seeds. When it changes color add mustard seeds and allow it to splutter. Put curry leaves stalks mix and pour to the curry. Hopefully everything is going well! I have never tried to cook dhal with meat before. An inspiration. Thank you! ffish curry with dal is of course a new experience. my wife refused to make this. now i have to oblige my college d blogger kuttan menon who is a good cook. i used to try out most your recepies immediately the moment it is seen, but this case i have to wait a lot. ++ thank you once again seena for this wonderful preparation techniques. This is a combo i have never had. I sso wish i had this for dinner. Delcious looking. Never heard abt dal and fish combo. But it sure does sounds yummy. Bookmarked it. Fish and Parippu seems like a new combination. At home we never cooked meat or fish with Parippu. It is definitely a dish loaded with lotsa proteins. I just made this recipe and it is quite tasty. BTW the template for your blog doesn't let us copy or print the complete page. Perhaps it is broken.